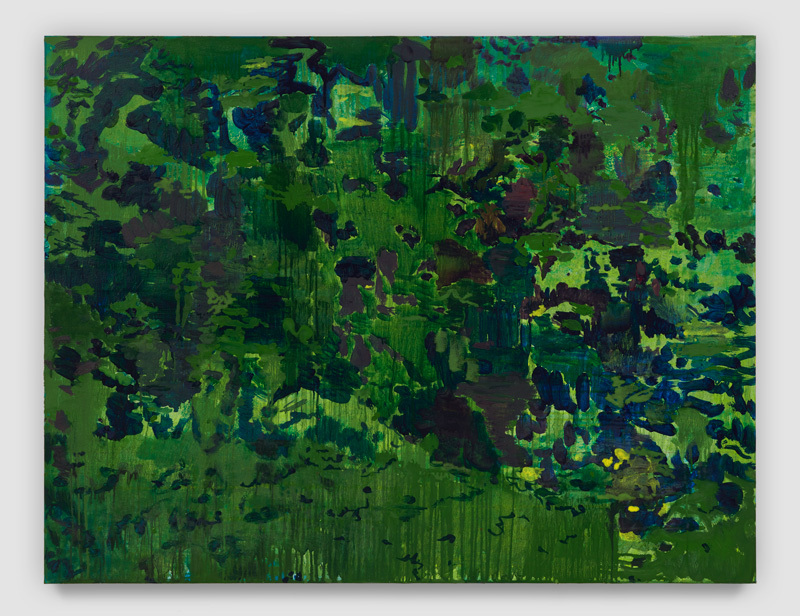 Rat Hole Gallery is pleased to present a solo exhibition of work by Hurvin Anderson on view from February 22 until May 18, 2019. Anderson is a British artist known for his paintings that draw upon his Jamaican heritage, exploring themes of memory, place, and time, while engaging with charged social histories and shifting notions of cultural identity and belonging. For his exhibition at Rat Hole Gallery, which also marks the first time for the artist’s work to be shown in Japan, Anderson brings together a selection of recent works inspired by time spent on the north coast of Jamaica, together with drawings serving as a conclusion to older bodies of work from his Grafting and Security Grille series. In revisiting an earlier theme but a stalwart of the Jamaican landscape, Anderson reinvents his Grille drawings in Camera Shake, using an image taken through the lens of a camcorder, giving the usually static and unyielding security grille a new sense of kinetic life. The drawing presents a compositional shift for the artist, signifying a break from the rigid constraints previously imposed by the subject. 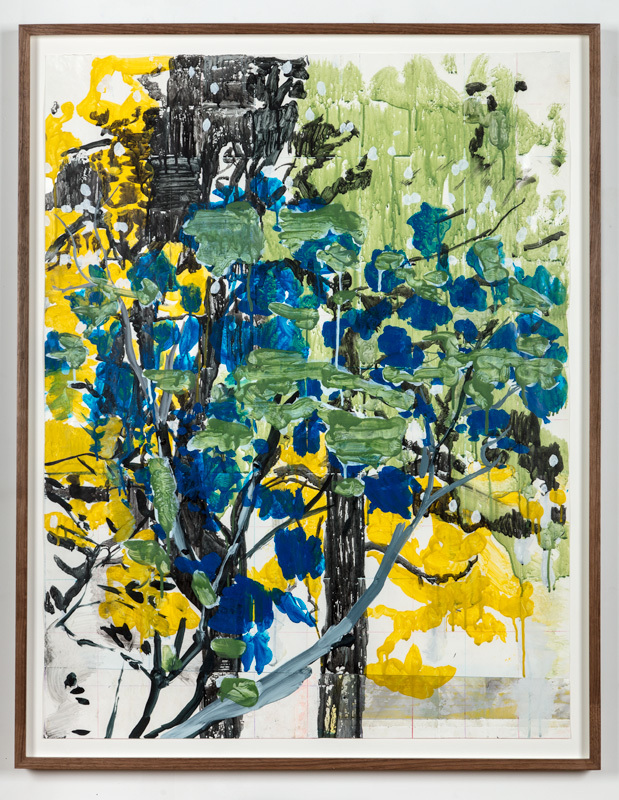 Similarly, the mango trees depicted in two Grafting series studies also evoke a verdant Jamaican scene, where Anderson plays with form and composition, upending the color palate and splicing multiple ideas and identities together. Inherent in many of the new works in the exhibition is inspiration drawn from a scene of hotel complexes dotted along the Jamaican coastline and the lush landscape surrounding them. As a viewer, it is unclear whether these Hotel Studies are depicting construction works at the beginning of their existence, the invigorating commencement of a project designed to fulfill holiday makers’ search for the ideal island nirvana, or alternatively, buildings left derelict, the failure of a project, and evaporation of a dream. 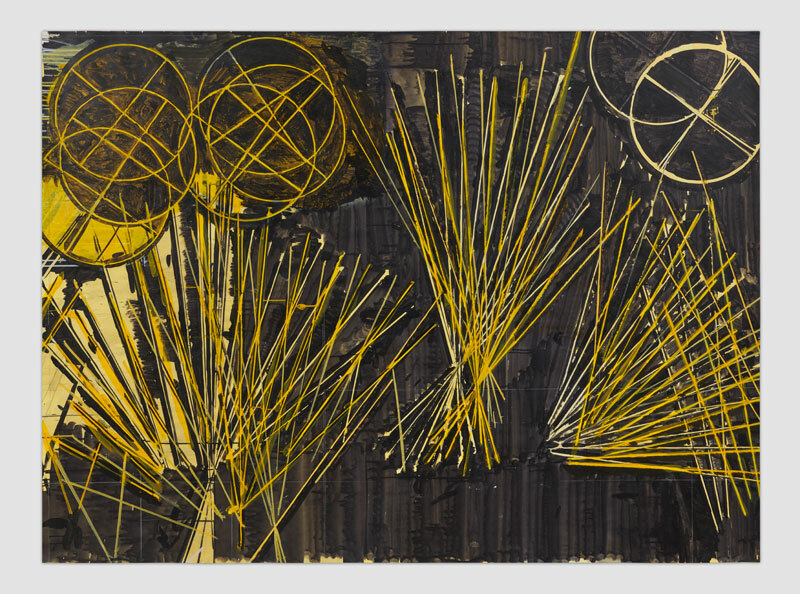 This ambiguity is heightened by Anderson’s stylistic and compositional decisions. In one of the works, the hotels blending with the Jamaican foliage are lent an ethereal atmosphere, while in another, the structures are almost floating amidst the undergrowth. In another, a staircase appears to disappear into the rocks the construction is perched on. It is as if the painter becomes the architect and Anderson has taken over where the builders have left off, defining and creating his own idea of a holiday makers’ idyll. In Anderson’s re-creation and exploration of utopian landscapes as his subject matter, reference to the imagined pastoral landscapes of Claude Lorrain and Nicolas Poussin can also be seen. Speech bubble also depicts an idyllic tropical view, but focuses the viewer’s gaze past the hotels to the beach and sea beyond. 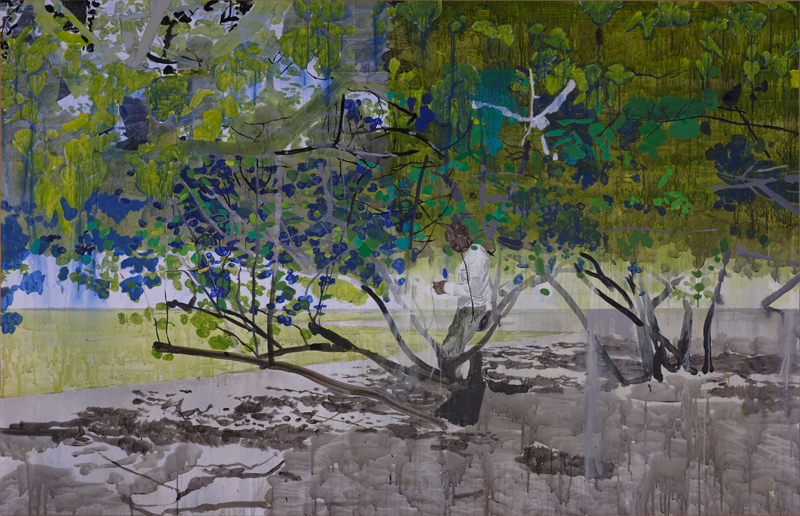 A figure seeks shade from the harsh Jamaican sun beneath an expansive sea grape tree, contrived by the artist to invite a narrative or a conversation, rather than to depict a scene that is simply observed. Beyond the hopes and dreams of visitors to the island, Anderson is also looking more deeply at ideas within Caribbean culture; the mythical and frequently discussed aspirations held by many of the diaspora of one day returning ‘home.’ He asks the question: What does ‘home’ look like? A utopian ideal? A land of equality, of freedoms and a simple, more fulfilling life where there is the time to stand still on a beach beneath a tree in contemplation. 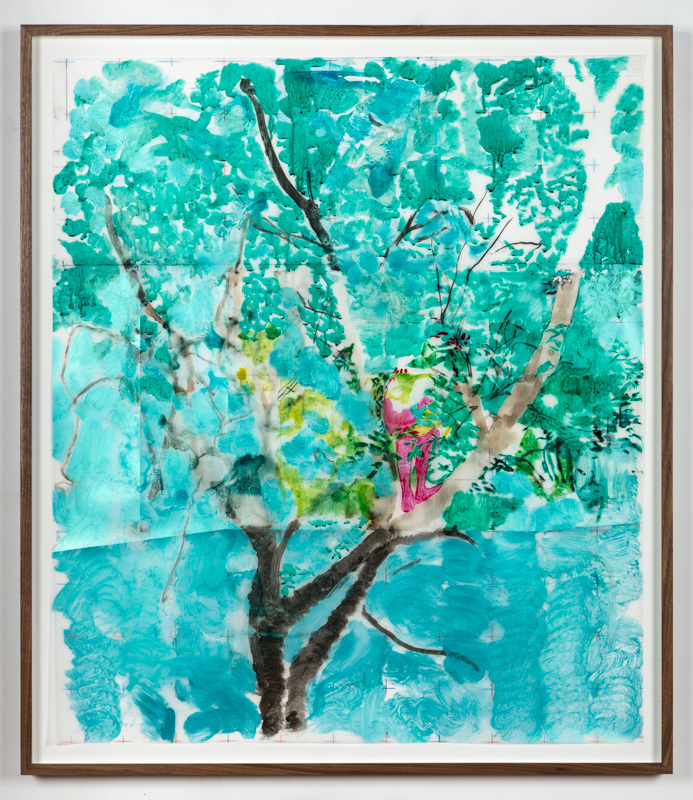 Hurvin Anderson (b. 1965, Birmingham, United Kingdom) lives and works in London. He studied at Wimbledon School of Art and Royal College of Art, London. Nominated for the Turner Prize in 2017, Anderson’s work has been shown in numerous solo and group exhibitions worldwide. Selected solo exhibitions include Foreign Body, Michael Werner Gallery, New York, USA (2016); Backdrop, Art Gallery of Ontario, Toronto, Canada (2016); Dub Versions, New Art Exchange, Nottingham, UK (2016); Backdrop, CAM, St.Louis, USA (2015); Reporting Back, IKON Gallery, Birmingham, UK (2013); Subtitles, Michael Werner Gallery, New York, USA (2011); and ART NOW: Hurvin Anderson, Tate Britain, London, UK (2009).